A Stunning Cast, Great Lines and Nothing More! Ted Demme's comedy drama ensemble piece bears a superficial resemblance to Barry Levinson's 1982 film Diner, but it's nowhere near as entertaining. As in Diner, the main characters are young male buddies who behave with exceptional ignorance around women, but unlike the guys in Diner, these fellows have few redeeming charms. The focal character, played by Timothy Hutton, returns to his small hometown in the north for a high-school reunion, and he catches up with his old gang of working-class cronies who still live in the town. He's having trouble making the big commitment to his girlfriend, and he hopes to sort out his thoughts during his stay, but his old friends are so hopeless in their attitudes toward women that he gets no inspiration there. The only person he connects with is the perceptive 13-year- old girl next door. The realism of the small-town setting and the snow-plowing business was promising, but this film didn't convince me. For one thing, so much of the comedy is out of sync with the rest of the film. At one point, for instance, Rosie O'Donnell flies through a comic monologue about the unreality of magazine superwomen, a speech that's unprovoked and, for an otherwise realistic film, unbelievable. 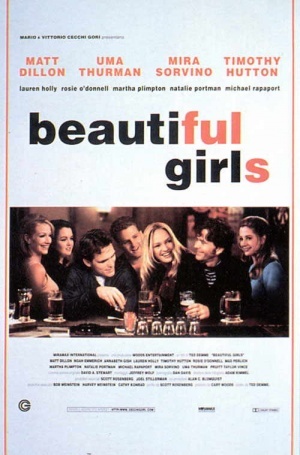 Similarly, one of Hutton's friends, played by Michael Rapaport, delivers a poetic monologue on supermodels that's a funny set piece, but it's incongruous in the larger context of the film, where he's an inarticulate Neanderthal. Making Hutton's father a zombie and his brother a moron was a one-joke cop-out that was distracting and unsatisfying. There are only a few moments when this movie really clicks. Mostly they come in the amusing conversations between Hutton and Natalie Portman, who steals the film as the young neighbor who is wise beyond her years. She teases him, flirts, psychoanalyzes, and draws him out about his love life through Socratic dialogue, until each becomes quietly smitten with the other. The acting of Portman in these scenes is positively magical, and I wanted so much to buy it, but her character is impossibly precocious, and her part is ultimately a bogus gimmick in a script whose inner workings, and failings, are too obvious. Also starring Uma Thurman, Mira Sorvino, Lauren Holly, Matt Dillon, Noah Emmerich and Pruitt Taylor Vince.